3. why BLF says “Hands off Zuma, arrest de Klerk”. Firstly, BLF wishes to welcome the mass land expropriation being conducted by our people from Eshowe, Orange Farm and Ivory Park to Hermanus in the Western Cape. These are legitimate actions to address a real historical problem. If you want land, you take it! Secondly, BLF wishes to congratulate both the National Union of Mine Workers (NUMSA) and civil society organisations for their victory last week in stopping the R1.4 trillion corruption at Eskom, which in turn is facilitated by the friends and relatives of Cyril Ramaphosa through the so-called tenders of the Independent Power Producers (IPPs) . We hope that the final court decision will confirm that NUMSA is correct to fight this fraud, which if allowed to continue, will result in over 30 000 job losses. 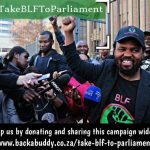 BLF also welcomes the passing into law of the Bill regarding the Public Funding of Represented Political Parties Act, 103 of 1997 (Act) to force political parties to declare their source(s) of funding. This is a victory for BLF which had made submissions to parliament to amend the Act so as to bring more transparency. We note that the only political party that voted against the Bill is the one that says Zuma is corrupt. We know now that the Economic Freedom Fighters (EFF) doesn’t want the people to know that it is funded via Robin Renwick (by London); and by the Stellenbosch and Italian mafia. Why not support openness when you claim to fight corruption? WMC in this country is allowed to engage in unlawful activities without any consequences. That is why the Stellenbosch mafia Prince, Markus Jooste, can tell parliament to get lost after disappearing R18 billion of state funds through corruption – R18 BILLION! BLF has always maintained that the most corrupt entities in South Africa (SA) are of WMC. Last week, the Competition Commission has revealed that media houses have paid admission of guilt fines. Because in SA the owners of the mainstream media are white, there has been no coverage on this issue. BLF has opened a case of murder and conspiracy to murder against FW de Klerk and his Minister of Police Adrian Vlok in May 2017. This case involves 22 criminal charges against FW De Klerk and 16 criminal charges against Adrian Vlok. The case was opened at the Hilbrow Police Station and then transferred to the Sebokeng Police Station. There has since been no progress in the case. This is surprising given the fact that BLF provided the police with a detailed statement on the crimes against our people committed by de Klerk and Vlok. There is even video material that corroborates the Truth and Reconciliation Commission (TRC) testimonies against the de Klerk regime. BLF calls on the Minister of Police, Mr Bheki Cele, to intervene and make sure that the former President of SA, an apartheid mass murderer, and his then Minister of Police are brought to book. It makes no sense to put the black former President Jacob Zuma on trial and let the white mass murderer former President de Klerk enjoy all the perks of a former State President in peace. This is what increases white arrogance and individual acts of racism. We remember the 17 year old twins Sadat and Samora Mpendulo; their 12 year old cousin Mzwandile Mfeya; 12 year old Sandiso Yose; and 17 year old Thando Mthembu who were cowardly murdered by de Klerk in their sleep in Mthatha on that unforgettable day of 8 October 1993 .Their deaths will not be in vain. FW de Klerk must be arrested for these atrocities. BLF has written to the Noble Peace Prize Committee to demand that it revokes the peace prize given to a mass murderer in 1993. We have asked the committee if it considers murdering black people part of its understanding of peace. BLF had warned the landless people of SA against the parliamentary fraud on land. The mainstream media has greatly assisted politicians to advance the lie that LEWC will be achieved any time soon. The truth is that the Constitution won’t be amended before the 2019 general elections. Politicians are playing political games for votes. The Constitutional Review Committee (Committee) tasked with “reviewing” section 25 of the Constitution has explained its mandate. The Committee says it will call for “public participation” from May 8th, 2018 starting in the Limpopo Province. The hearings are to gauge the “necessity” and “mechanism” for LEWC. In other words, the Committee will not be putting amendments before parliament in August this year but will be submitting recommendations from the “public hearings”. The landless have been lied to. 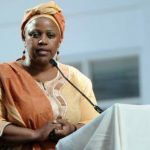 The whole parliamentary motion was a stunt to garner support in the 2019 elections – it was not for land return without payment. It was an act of propaganda to deceive our people into thinking that an agreement has been reached to amend the Constitution. Now the Committee is going back to seek the opinions of the public on a matter where national consensus has long been achieved. This is a delaying tactic. BLF wishes to remind the landless majority that there has already been public hearings on land expropriation – a Bill to this effect is with the Public Works Portfolio Committee in parliament. All that was needed was to amend that Bill so as to bring it in line with the proposed constitutional amendments and if necessary test the enhanced Bill via public hearings. This would have ensured that the Constitution is amended before the 2019 elections. BLF calls on our people to make it clear to all the political parties in parliament that if no amendment of section 25 of the Constitution is realized before the 2019 elections, then they will not vote for liars. Lets stop politicians from lying and making empty promises. 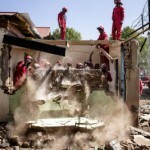 Land expropriation without compensation NOW – is possible! BLF won’t wait for parliament and liars. We shall continue with people-driven LEWC. The land is ours! BLF notes that the the National Prosecuting Authority (NPA) has, after almost two decades, decided to prosecute former President Jacob Zuma. We note further that the ANC of Cyril Ramaphosa and the Communist Party of Blade Nzimande are conspiring to ensure that President Zuma is isolated and treated as a pariah. The ANC says it respects the principle of “innocent until proven guilty” yet it is intimidating its members who may want to support President Zuma. Similarly, BLF notes how the Stellenbosch mafia-controlled opposition parties have been working hard to try and deny Comrade Zuma legal representation by denying him legal aid. They charge President Zuma and then turn around and say that his legal fees must not be paid by the state whereas he acted as the President of SA when charges where brought.p against him. BLF is disgusted by the hypocrisy of the Democratic Alliance (DA) and its ongoing racism. Helen Zille’s legal fees in the Equality Court, (sitting in the Western Cape Division of the High Court) case instituted by BLF, are paid by the State. BLF was given confirmation in Court that indeed Helen Zille’s legal fees are paid by the State. The court case is about Helen Zille’s racist utterances in terms of which she insulted black people via her personal Twitter handle. The DA and EFF are fine with the State paying Zille’s legal fees but want to deny Comrade Zuma’s right to be represented and to this end defend himself in respect of the bogus charges against him. Former President Jacob Zuma is being persecuted for his stance on Radical Economic Transformation (RET). 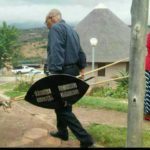 WMC had captured the top leadership of the ANC at its elective conference in Nasrec in December last year and is now hunting down and punishing all the RET forces. The persecution of Comrade Zuma is done at the instruction of the Stellenbosch mafia. 6. calling for black unity to defeat WMC and return land. 8. launching the Revised Mining Charter which gives blacks 30% ownership in 12 months and prescribes over 50% black ownership in respect of procurement. The above are some of the measures that has angered and terrified WMC. That’s why schemes are hatched to try and intimidate the forces of RET which have been unleashed by President Zuma. The lies about the charges are now open to all to see. The media and opposition parties have promoted the lie that comrade Zuma was facing 783 charges. They were lying knowingly. They just wanted the people to turn against President Zuma. It was all propaganda. Now we know there were only 16 charges. BLF believes that the charges against President Zuma are a fabrication to silence him. It is shocking that these charges emanates from a forensic report by KPMG. We remind the nation that KPMG is a discredited corrupt auditing firm. KPMG doesn’t produce credible work and is available to be bought by any one with money and influence. KPMG’s work is proven to comply with no ethical norms at all. When WMC put pressure on it in defence of Pravin Gordhan, KPMG – without any sound and rational reason – withdrew its forensic report commissioned by the South African Revenue Service (SARS). The withdrawn report corroborates two other independent reports which reveal that Pravin Gordhan had established a “rogue unit” inside of SARS to spy on other goverment agencies like the NPA. BLF has marched to KPMG and delivered a memorandum of demands. This memorandum includes the demand that KPMG must withdraw its bogus report against President Zuma in the same way that it has withdrawn its report regarding Pravin Gordhan on his “rogue unit”. BLF has last week written a follow up letter to KPMG to demand progress in the matter. BLF calls on all our people to come out and say #HandsOffZuma. BLF is calling on our people irrespective of political party affiliation to come out on the 6th of April to defend President Zuma and RET. The 6th of April is the day Jan van Riebeeck arrived in SA and started all our problems in 1652. Almost four hundred years later we have the same problem. We must not allow the second colonisation by the judiciary. There are also more organisations and churches that have pledged to join the action on the 6 April. They kicked President Zuma out of office; charged him; are trying to isolate him; and want to deny him legal aid as well as representation. Kanti wenzeni umsholozi? The courts and judges are being used for politics. It is clear to us that WMC wants Zuma in jail to stop the momentum of RET. Uzuma akanacala. BLF is also considering joining the court action by the South African Native’s Forum for the permanent stay of prosecution.